For the city in Texas, see San Antonio. San Antonio is partly agricultural, and partly a bedroom community for Socorro and White Sands Missile Range. The city supports a few small businesses, which include the original Owl Bar and Cafe (featured on an episode of the Travel Channel's Burger Land in 2013), The Buckhorn Tavern (featured in 2009 on the Food Network's Throwdown! with Bobby Flay,), San Antonio Crane, a restaurant featuring Mexican food, a seasonal roadside market, and a general store. San Antonio is the gateway to the Bosque del Apache National Wildlife Refuge. Interstate 25 runs along the west, and U.S. Route 380 begins there and heads east to Carrizozo. The Rio Grande is just to the east of San Antonio, and the BNSF Railway runs through it and has a small yard, little more than a siding. 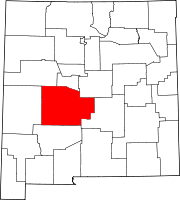 While still part of the New Mexico Territory, the town was the birthplace of Conrad Hilton. His father was a merchant and hotelier in San Antonio, and Hilton learned the hotel trade there. Hilton was one of the original legislators in the newly formed state of New Mexico, and founded the Hilton Hotels Corporation. San Antonio is about 28 miles from Trinity Site, where the first nuclear bomb was detonated on July 16, 1945. Residents reported tremors like an earthquake and the town received some of the remnants of the mushroom cloud, resulting in some radioactive contamination of the area, which faded quickly and does not persist today. The town was the meeting place for the scientists who detonated the bomb. ^ "GCT-PH1, Population, Housing Units, Area, and Density: 2010 - State -- County / County Equivalent, 2010 Census Summary File 1". United States Census Bureau. ^ "Food Network on the Web: Manny's Buckhorn Tavern San Antonio NM". Archived from the original on 24 January 2013. ^ Szasz, Ferenc Morton (1984). The Day the Sun Rose Twice. Albuquerque, NM: University of New Mexico Press. Wikimedia Commons has media related to San Antonio, New Mexico. This page was last edited on 8 April 2019, at 15:01 (UTC).